Sony STR-DH800 review | What Hi-Fi? Its price-tag may befit a budget product, but the STR-DH800 isn't the amp that Sony forgot. In fact, this model is fine-tuned by the same engineers who tweaked Sony's £1500 STR-DA6400ES, as well as the 'DH800's five-star predecessor, the STR-DG820. The 'DH800 keeps it simple. 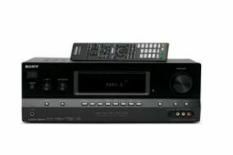 At this price, it's no surprise to find that luxuries such as video upconversion or upscaling don't feature, but standard prerequisites are in place, including four HDMI inputs and an accurate auto-calibration system. More importantly, this receiver will decode all the current HD audio formats. Straight out the box, the Sony has a rather cold, aggressive sonic style. But, after a day or two operating at full steam, it eases up. The edge is taken off and is replaced with a solid, detailed sound. If you're after extra refinement and muscularity, you'll need to spend more, but the Sony demonstrates impressive force for the cash. During Knowing, as the airliner crashes, the Sony delivers power and drama, along with a cohesive sound stage. Shop around online and you'll find some retailers are already shipping the STR-DH800 for £20-£30 less than the price quoted here. For AV enthusiasts on a tight budget, this is a steal.